Around October last year, we held our Ting Hun or Chinese Engagement. The preparation for the occasion wasn’t that easy especially as we planned our Ting Hun for only two weeks. Almost every other day, my aunt and I go out to look for stuffs we need. I spent my nights researching about the said occasion. Decide where you will hold the occasion. You can have your Ting Hun in your house but since there will be a lot of stuff to take care of, you can hold the occasion in a restaurant or hotel. In our case, we chose the hotel. At 8am, I was already waiting for my make up artist, Toni Aviles, to do my makeup. At 9am, my fiancé then was already in the hotel overseeing the preparations. We started our Ting Hun at 10am. The groom’s entourage of 6-12 people was first to enter the room. 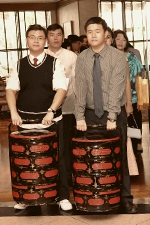 The first two carried the Sin Na (a 4-layered basket made out of bamboo). The last one to enter was Dexter, my groom to-be. He had 2 bouquets of flowers with him. There was a red table in the receiving area with displays, which include jewelries, boxes of clothes, basket of eggs, pomelo, 2 sets of cakes, etc. In front of the table, there were 6 chairs on one side for Dexter’s family, and 6 on the other for mine. After seeing Dexter face-to-face, we went to the red table, started putting the corsage/ boutonnière and then proceeded with the jewelry-giving. The jewelries came from Dexter’s side and his father, mother and aunty put the jewelries on me. (If grandparents are part of the entourage, the order will be oldest to youngest.) Then, my mother gave my fiancé the necklace and my father gave him the watch. We closed the jewelry-giving by putting the rings on each other (yep, just like in church wedding ceremonies). After the jewelries, the tea ceremony followed. I (speaking in Chinese) offered tea to my future in-laws and his other relatives. I called my future father in-law ‘papa’ and so on. My fiancé did the same. He offered tea to my parents and started to call them ‘daddy, mommy’ and not ‘uncle, auntie’. 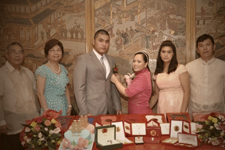 When the tea ceremony was over, we had picture-taking with our guests. Afterwards, my mother invited the whole entourage to eat misua soup with egg. The misua had 2 boiled eggs and 2 ang cho (Chinese red dates). If you will not eat the eggs, you should just leave them. If you will only eat one, you must slice the second egg in to two. Remember, everything must be in pairs, even the ang cho. The ceremony ended by bringing the cakes around the hotel. My fiancé took the cake with my name on it and his closest cousin took his cake. Both of them walked around the hotel lobby (don’t worry, one round was enough). 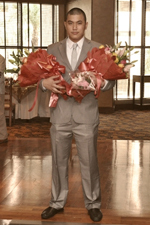 While they were away, I was distributing the flowers to the single ladies. Bags of goodies were also prepared for the guests (prepared by Dexter’s family) to be given during the reception. Our bag giveaways had apples, oranges, pork leg, fruit cocktail, candies and biscuits. After that, you may relax and eat. Enjoy the food! It can be tiring preparing for a Ting Hun but trust me; it is such a wonderful experience.